This recipe includes both a quick method and a longer method form preparing Jambalaya. I suppose we could argue over whether this recipe is Cajun or Creole. My understanding is that the Creole version has tomatoes and is a red color, and the Cajun version doesn't have tomatoes and is brown, getting its color from the deeply browned meat. After you make this, you be the judge. One of the great things about Jambalaya is that you can throw in just about anything you want, and while the character of the dish changes, it is still good, and still Jambalaya. If you caught some crawdaddys, then throw them in with the shrimp, or instead of the shrimp. Or other seafood, like mussels could be added at the same time as the shrimp. If you have some leftover alligator, then dice it up and add it to the mixture when you add the other meats. Heat oil in in a large non-stick pot. Sauté onion, green pepper, celery, and garlic until tender. Add cooked chicken, ham, sausage, and shrimp. Cook five minutes. Add remaining ingredients. Mix well. Bring to a boil. Cover and reduce heat to low. Cook 20 to 25 minutes or until rice is done and liquid has been absorbed. 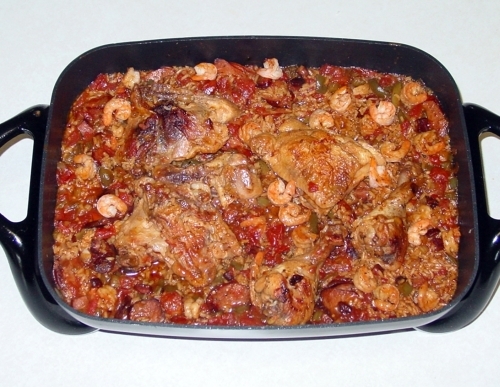 Using uncooked chicken, in a large non-stick pot (this would traditionally be a cast-iron pot) over high heat, brown the chicken, ham and sausage until the chicken is well browned, turning only once to brown both sides of the chicken. This will brown some of the ham and smoked sausage quite darkly. Reduce the heat to low, cover and cook for 10 minutes. Add the olive oil, and the "holy trinity", onion, green pepper, and celery. Cover and cook until onion is translucent, about 10 minutes. Add the remaining ingredients except for the shrimp, and stir to mix well. Cover and simmer 10 minutes. Place the shrimp on top of the mixture. Cover; bring to a boil, then reduce heat to low. Simmer for 10 to 15 minutes until rice is cooked and liquid has been absorbed. Use pre-cooked chicken for the quick method, uncooked chicken for the longer (better) method. I like to use bone-in chicken drumsticks and thighs, as they do not dry out like chicken breasts can. If you want to, you can substitute duck for the chicken. Any smoked sausage will work fine, whatever brand you wish, for instance Hillshire Farm Smoked Sausage, hot or mild, but if you want to be more authentic, use andouille (a spiced, heavily smoked Cajun pork sausage) or chaurice (a Creole sausage containing chopped onions and parsley, thyme, bay leaves and allspice). A converted rice, like Uncle Ben's white rice works nicely, but I prefer long grain white rice. You can use any kind of rice that you like, but the dish will vary greatly. Short or medium grain rice will make the dish too sticky for my taste. Since there is no salt in this recipe, you want to use regular soy sauce, not "low sodium" soy sauce. I like to use more TABASCO® sauce -- a Tablespoon is good, however this may be a bit too spicy for some.